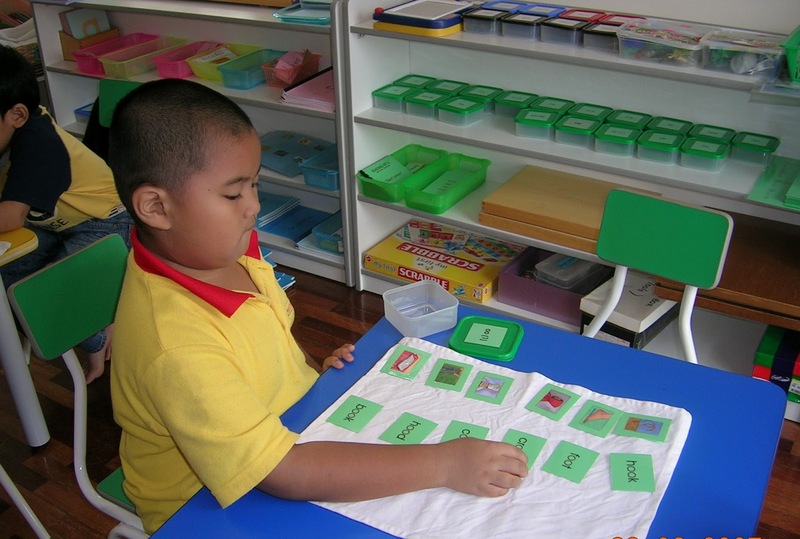 Choosing a kindergarten or preschool for my kids was a big thing for me and I think maybe I went a bit overboard going to so many kindergartens and montessori preschools in Mont Kiara, Sri Hartamas and Solaris Dutamas. In the end, we went back near our previous place of residence at Damansara Mutiara. 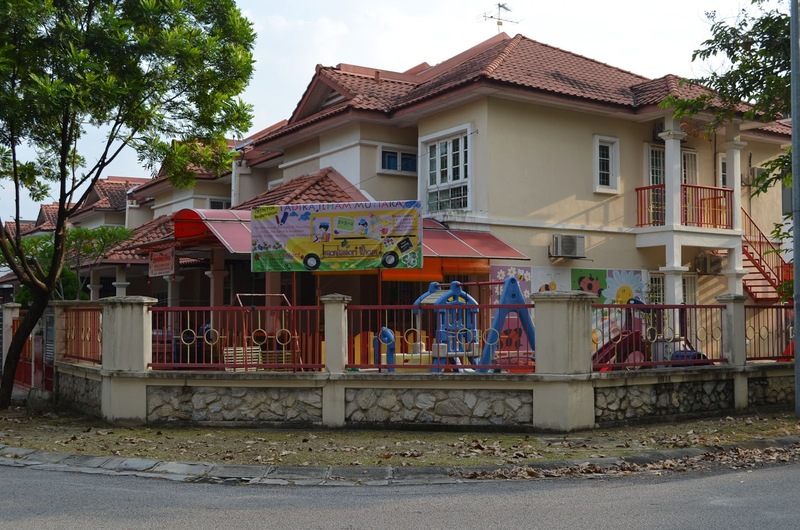 Mutiara Homes just in front of The Curve Shopping Centre / e@Curve is a residential area that holds a treasure of kindergartens and montessori pre-school. 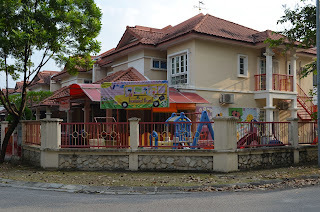 If you stay near Mont Kiara, Taman Tun Dr Ismail or Damansara Perdana, this place is a good place to start looking for a pre-school and daycare for your kids. Try driving around the area to have a look. There are at least 3 at Jalan PJU 7/12 itself. There's Peter and Jane Kindergarten just at the entrance of Jalan PJU 7/12, Young Thinkers at no 21 and Montessori Ilham at no 87. For hubby and myself, we are already exhausted with researching preschools for our two kids. Our considerations are affordable fess as we are sending two kids (that automatically scratch off most Montessori in Mont Kiara with the exception of HanaSuria) halal food prepared at school or by a Muslim lady (that cancels off HanaSuria) and teachers that look like teachers and care like mothers (if you know what I mean). 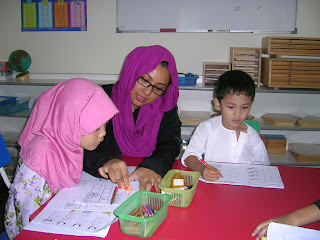 That day, we actually had two appointments to look at Montessori pre-school at Mutiara Damansara. One was Young Thinkers and the other was Montessori Ilham. 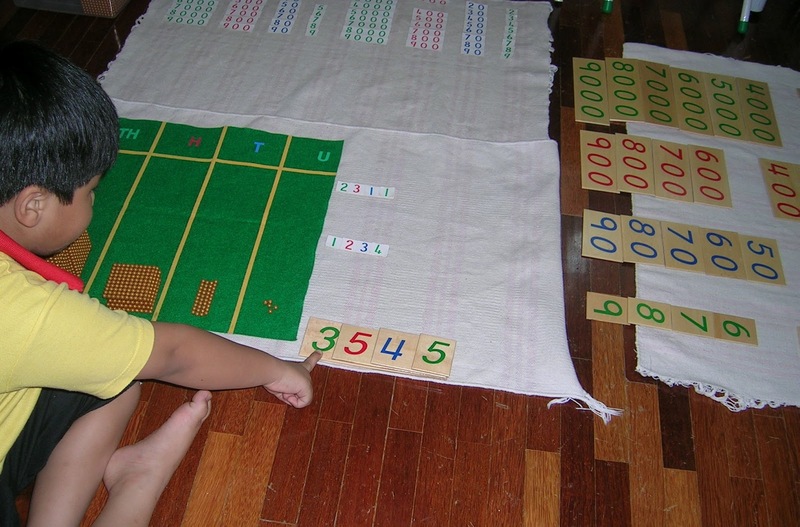 Even though, we passed Young Thinkers first, somehow by chance, we decided to look at Montessori Ilham first and I immediately feel at ease with it. I love this Montessori preschool, it has an outdoor playground with swings and slides and those rocking kiddy rides and a shaded outdoor area for kids to play cooking with a toy kitchen (beats me why my sons like playing with this) and two small tanks that house a turtle each. Inside the Montessori preschool, I see some Montessori materials and books are big and interesting (though a bit dog-eared but still in pretty good condition). Children artworks decorate the walls and when I was there, they were doing spaghetti and meatballs. Cute! 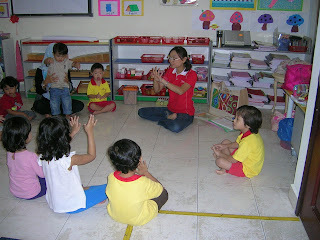 What I like about this Montessori preschool is that the are 3 teachers, Ms Yoges, Ms Vivian and Ms Safiyyah and they all look capable and kind. I asked about their qualifications and Ms Vivian replied that they are all degree holders. I also like the fact that the kids do art and craft during school hours, Agama (religious studies) on Thursdays and Musikgarten on Fridays. The clincher is of course the small number of students at this moment as they moved to Neo Damansara last year so a number of kids transferred to other kindergartens but the move didn't work out so they shifted back to their original place at Jalan PJU 7/12. But, with their program and warm environment, I'm pretty sure more students will enroll soon. By then, my second son would already be used to the place, so I'm not too concerned about it. If you are a Muslim and have othet considerations like me, this Montessori offers Iqra' classes. 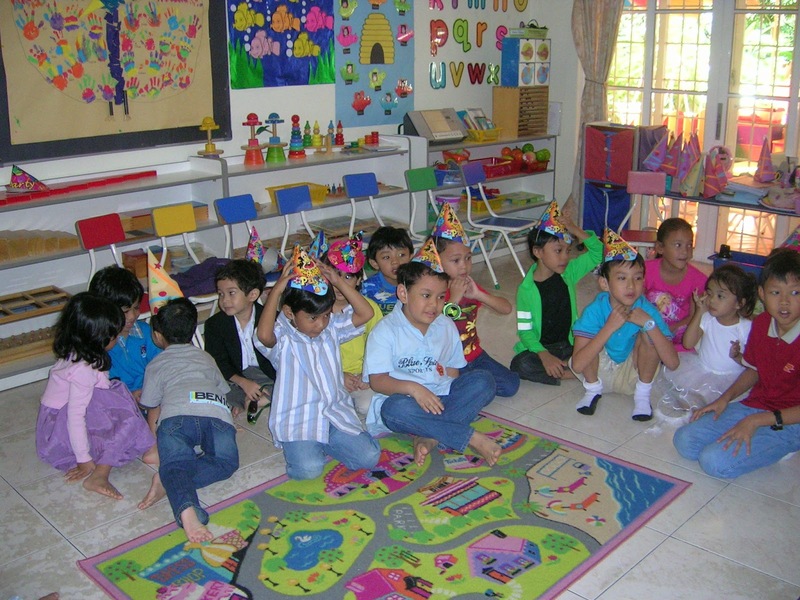 Montessori Ilham hosts parent-teachers meeting twice a year and an annual concert for the kids. They also have school excursions and this coming 26th March the kids are going to a supermarket to learn about food and experience buying their own groceries. 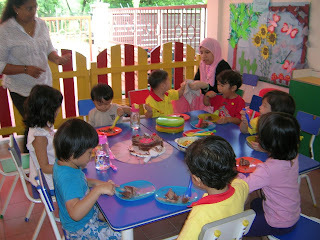 School hours are form 8.30am-12.30am and daycare pick-up is at 6.00pm. Fees are quite reasonable at RM380 for half day and RM720 for full day with lunch. Other fees such as registration, deposit, misc and uniform apply. So, it looks like I'm enrolling them in Montessori Ilham even though it's quite a distance from Sentul East and I have to send and fetch them myself. These are some pictures of Musikgarten last Friday and a birthday celebration of one of the kids there. If you are staying in Taman Tun Dr Ismail, Mont Kiara or Mutiara Damansara, you might want to check this place out. Montessori Ilham is at no 87 Jalan PJU 7/12 and you can take a look at their blog here. I find all your blogs so helpful, thank you for writing. We have just arrived in KL and are looking for Daycares and places to take the kids around The Curve area so this is all very helpful. Visited all these today and also liked Ilham the best too! I will be residing in KL soon in June 2013 and kinda browsing the net for good full day care centre that provides montessori learning...pls advise.I kinda like Montessori Ilham.Initially i looked at the MMI website but i thing they do not provide full day care.